As satire goes, Hollywood is a plump easy-target. Ben’s Stiller’s first film as director since Zoolander blasts at it with full firepower – but not too much accuracy. Then again, he really can’t miss. Not with Tropic Thunder , a megabucks war-movie spoof about a cast of narcissistic actors stuck in a real-life combat zone. Not with Robert Downey Jr as a five-time Oscar-winning Aussie Method actor who’s surgically dyed his skin to play a black man. Not with Jack Black as a drug-munching fatman. Not with Stiller himself as a muscled Rambo-style action-doofus. Directing, producing, starring and co-writing, Stiller intros them all with some amusing fake movie trailers: action franchise Scorcher VI: Global Meltdown, starring Tugg Speedman (Stiller); gross-out comedy The Fatties: Fart 2, starring Jeff Portnoy (Black); and arthouse drama Satan’s Alley, starring Kirk Lazarus (Downey Jr). Their new project is Tropic Thunder, a Vietnam epic touted as “the biggest war film ever”. But after exasperated rookie director Steve Coogan falls “a month behind schedule five days into shooting”, he dumps his egomanic stars into the jungle with hidden cameras to put the real back into his reels. Cue the carnage as Tugg is taken prisoner by heroin-farming militants and the actors have to lock’n’load to save him. Don’t get us wrong: their are great moments here. Tugg’s Oscar-baiting tearjerker Simple Jack, about a mentally challenged farmer who thinks animals can understand him. Kirk’s brilliant theory that you can never win an Oscar if you go “full retard”. It’s the kind of quickfire sketch-show humour that Stiller nailed back in his Emmy-winning TV series The Ben Stiller Show. But mostly, Stiller’s happy to keep punting for the easy laugh until the cheap gags and jokey political incorrectness get lost in a fog of bore. Then something happens: a bulky, bald, hairy-armed studio boss called Les Grossman steps on to the screen and starts swearing like Tom Cruise in Magnolia. Then something else happens: you realise it is Tom Cruise. Whether calling his assistant as a “nutless monkey”, hurling F-bombs down the phone or boogying to his favourite tunes, Cruise is grotesque, amazing and funnier than anything else in the movie. No exaggerating – it’s a showstopper up there with Cruise’s career-best. It’s also the comedy performance of the year. Lucky, too, because almost everything else in Stiller’s movie has been done before and better – plenty of it by Stiller himself. 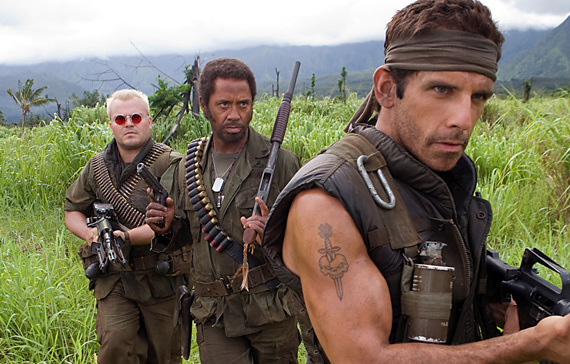 Lensed by master cinematographer John Toll (who won an Oscar for Braveheart ) and throwing its $100-million budget up on the screen, Tropic Thunder runs dangerously close to being exactly the kind of Hollywood blockbuster it’s trying to mock. Big, noisy and silly, Stiller’s war-spoof shoots some zingers and plenty of duds, too. But Tom Cruise is bang on target, uncorking the funniest performance of the year. Somehow, we’re not joking.